UMP | University of Minnesota Press Blog: Jack Zipes: "Fairy tales evolve and spread in strange ways." Jack Zipes: "Fairy tales evolve and spread in strange ways." 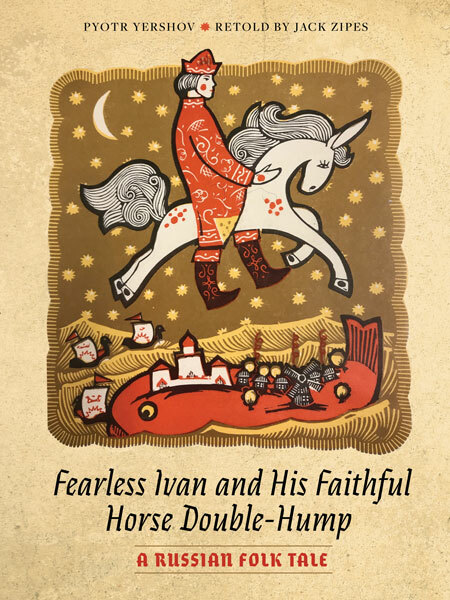 I first came across Pyotr Yershov’s fairy-tale poem, The Little Humpbacked Horse, when I was preparing my fairy-tale postcards for publication in my book Tales of Wonder. Among the Russian postcards in my collection, I kept finding cards illustrating The Little Humpbacked Horse by different gifted artists, often with short texts or messages written on the back side of the cards. It was as if I were receiving unusual messages from Russia with love. My curiosity aroused, I decided to find and read Yershov’s poem in English and to find out more about the author himself. When I finally obtained a couple of English translations in verse, I was stunned. I discovered Yershov was a young man from Serbia who wrote this poem in 1834—primarily for adults—and that the great Alexander Pushkin esteemed Yershov’s work and predicted a great future for him as a writer. More significantly, I learned Yershov had transformed oral Russian folk tales such as “The Firebird and the Gray Wolf” and “Sivka Burka” into a witty, anti-tsarist poem. It was for this reason that his poem was more or less censored or banned until the Russian Revolution of 1917. Then, since Yershov’s work was a critique of the aristocracy and of a tyrannical tsar, the poem was republished and illustrated numerous times from the 1920s to the present. It was even made into a ballet and animated film. And the target audience became children more than adults, who continued to respond favorably to the poem because it tended to offer a critique of Stalin and dictators in general. Well, I thought to myself, even though Russians and Europeans may have more experience with dictators and brutal aristocrats, this poem may have meaning for democracies on the brink of becoming authoritarian societies. Why not adapt the poetic versions into good terse English prose and illustrate the fairy tale with Russian postcards. They might teach us a lesson. Why not make the poem even more critical of fascist rule than Yershov’s poem did? Why not strengthen the wonderful friendship between little Double-Hump (whose name my wife created) and brave Ivan? Why not have the princess and Ivan simply disappear at the end and leave the people to decide how their country will be governed? Fairy tales evolve and spread in strange ways. In the case of Fearless Ivan and his Faithful Horse Double-Hump, the Russians can teach us a lesson or two of how to combat absolutism. Many Russian fairy tales resonate like letters from Russia not only with love but with freedom, and I want to share them in English with young and old readers. And, of course, I have thrown a good deal of joy into the mix. Jack Zipes is professor emeritus in the Department of German, Scandinavian, and Dutch at the University of Minnesota. 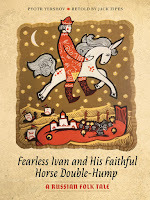 He is the author of more than forty books, including Fearless Ivan and His Faithful Horse Double-Hump (a retelling of Pyotr Yershov's Russian folk tale, Minnesota, 2018); Tales of Wonder: Retelling Fairy Tales through Picture Postcards (Minnesota, 2017); The Brothers Grimm: From Enchanted Forests to the Modern World; Breaking the Magic Spell: Radical Theories of Folk and Fairy Tales; and Happily Ever After: Fairy Tales, Children, and the Culture Industry.